Posted by kencarroll February 16, 2008 in the Group General Discussion . 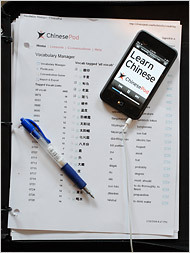 Here's the New York Times article about ChinesePod (and, er, other things). It features a nice photo of a Vancouver-based learner, Mike Kuiack studying rather assiduously. So, that's how it's done!